THERE’S plenty of driving talent assembled in each of the class battles that will surely be a highlight of the 2018 Liqui-Moly Bathurst 12 Hour. Following our rundown of the outright class yesterday, today we take a deeper dive into the drivers locked in for the various classes. THIRTEEN GT4 cars are on the grid for 2018 and it’s set to be an incredible battle. The two KTMs were the first to announce their driving pairings, their first car will be piloted by Justin McMillan, Tim Macrow, David Crampton and Caitlin Wood; a unique blend of experience in the car, the race, the sport in general and with KTMs specifically. This week came the outstanding news of some legendary surnames partnering in a BMW M4 GT4 – 12hr and Bathurst 1000 winner Tony Longhurst giving young-guns Aaron Seton and Matt Brabham a shot alongside him in the Boat Works entry. It’s a great combination, too. Seton has raced pretty much everything with four wheels in the last 24 months while Brabham has broad experience (Including an Indy 500 start with Pirtek Team Murray) and has remained sharp with Super Truck and even Supercars appearances in the last year. The combination of great names and talented drivers will make this car one of the best to follow throughout the race. 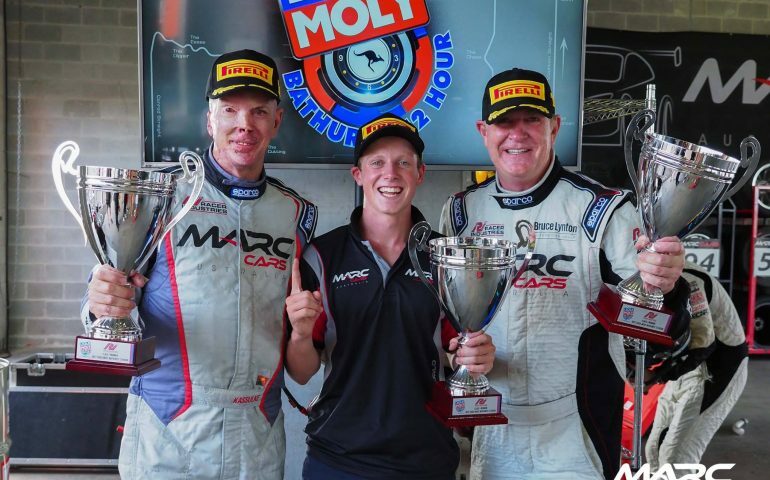 MARC Cars Australia then went big earlier this week by confirming a majority of their vast squad. The three new-generation ‘MARC II’ entries will be very strong on their debut. The first car features 12-hour outright winner Rod Salmon, Will Brown and Keith Kassulke; the trio also the defending class winners from 2017. Jake Camilleri will have Aaron Cameron and Morgan Haber with him while Tony Alford will return in the Donut King car with Kyle Alford and Chad Parrish. Geoff Taunton has drafted in Super2 racer Bryce Fullwood and Jason Busk to co-drive his car, while open-wheel young guns Zane Goddard and F4 champion Nick Rowe will share another entry, with a yet-to-be named third driver. Tyler Everingham and BTCC racer James Kaye will be paired together (third driver TBA), while John Goodacre will have MARC and B12hr regular Rob Thomson with him. Several of the MARC Cars slots are yet to be announced.